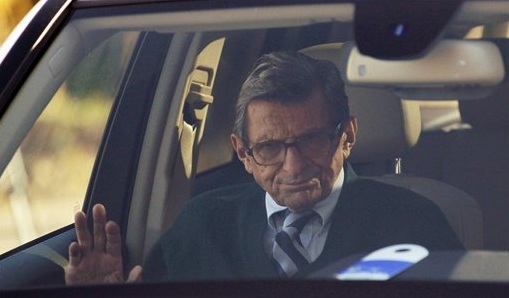 This image of Joe Paterno was taken on November 9, 2011 - after he announced his retirement - but a few hours before the Penn State Board of Trustees fired him. At first glance what most people see is a half-hearted attempt at a smile. This is one of several variations of what is known as a "Social Smile". If you look just at Paterno's mouth - this would be sub-classified as a "bitter smile" (Ekman). Of course, it does not represent joy or happiness. It is characterized by a closed mouth, lips moderately lightened, with the corners drawn more laterally than a sincere smile. The cheeks are bunched-up (contracted) but this contracture is lower on face than that of a true, felt smile. It often co-exists with other negative emotional signs - see below. Superimposed on this variation of a "Social Smile" is disgust. Joe's "mustache area" (below the nose and above the upper lip) is tightened and elevated along with some nasal flaring. In addition, the nasal-labial furrows (creases running from the lower sides of the nose past the corners of the mouth) are deepened. These are very characteristic signals of disgust. Disgust is not always an emotion felt toward others, sometimes it is self-directed. Extremely telling here is Coach Paterno's central forehead muscle contraction. When you see such a display, you should think first of pain - either emotional or physical. These pains may be directly being experienced or felt through empathy. Since we know the story (or part of it) behind his departure, his pain here is emotional. As you learn nonverbal communication, be careful not to place too much emphasis on only one signal. Depending on their contexts - these signs may have wholly different meanings. Body language must be interpreted in totality. This photo of Joe is a great example - that in the real World, it is very common to see several emotions simultaneously. Here we see displayed: a social smile (bitter smile), disgust as well as (emotional) pain. When several signs are seen at the same time or nearly so - these are known as "clusters"- which are analogous to sentences. How fluent are you?